I wonder what bird songs most bloggers wake up hearing and how loud are they? I became aware just how noisy the birds are around here when I was talking to my son on skype early the other morning. Suddenly he interrupted the conversation by saying "What IS that noise?" I hadn't even realized that there was a white Cocky (Sulphur-crested Cockatoo) flying close to the back door. Their usual sound is a loud screech and I often have a score or more fly over my house early in the morning. Rainbow Lorikeets also fly over very early and since their flocks are even bigger they make almost as much noise although it is higher pitched. The earliest of all are the Kookaburras. They start their chorus of laughter before it is even light - a very good alarm clock if I needed one! 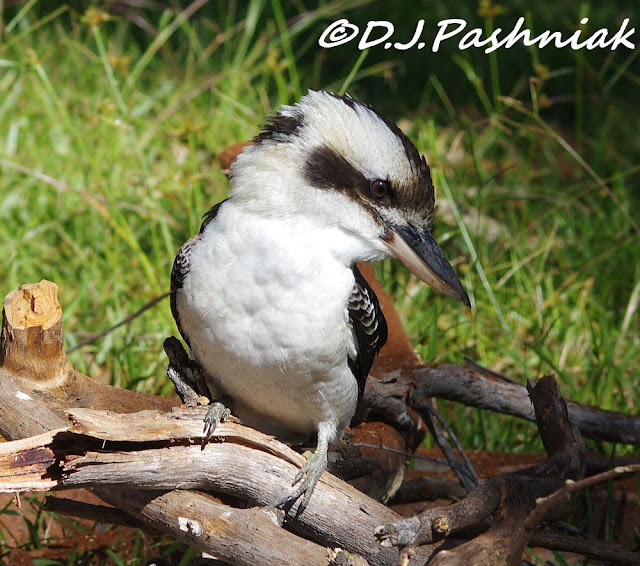 These photos of a Kookaburra were taken later in the day when one flew down onto a pile of branches to pick up something that it had seen moving close by. This is not in my yard - my dog doesn't like birds invading her personal space! 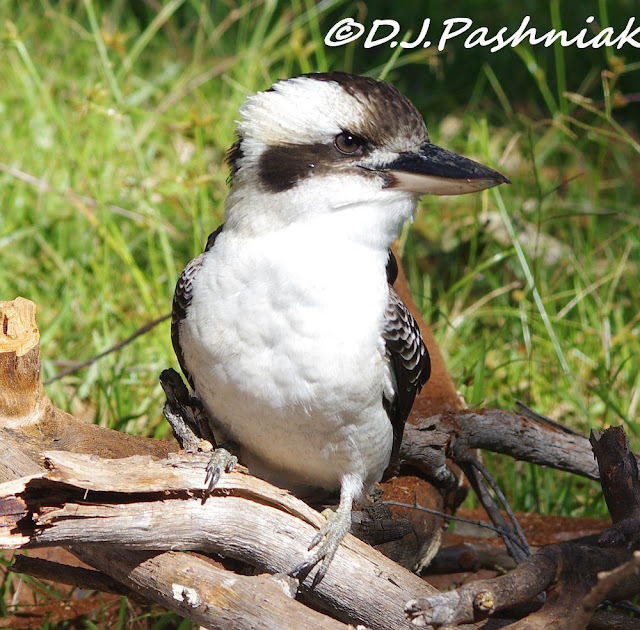 Beautiful shots of the Kookaburra, this one has nice colouring too, you are lucky to have them around, we used to. Our dog also ferociously protects our yard from birds and cats. Great close up!! Boom & Gary of the Vermilon River, Canada. We visited the Field Museum in Chicago this past weekend, and out granddaughters really got a kick out of playing the Kookaburra song/call-- repeatedly! There is just something about these Kookaburra birds that I love! Great shots! Great photos of the Kookaburra. Isn't he a handsome guy! These are delightful birds, I love their song. Fabulous shots! Beautiful shots of the Kookabbrra, Mick! You, who live down in Australia, have the most super bird species...ever!! This Kookaburra is fabulous. As for the one bird we wake up to in song is the Mockingbird. But it's not really all that noisy, just a beautiful soft song. And never the same; always a different song. I did not know it was "classically noisy Australian Birds week" - but I got my post in anyway!! I love these birds - Bushman's clock! Beautiful pictures of this beautiful Kookaburra. What a gorgeous bird, great pictures. Mick, these are superb close ups. I love bird alarms, it's such a wonderful way to wake up...but of course I can only imagine the sounds of your wake-up calls. The kookaburra is the cutest bird with the cutest name, EVER! Great photos of a great bird. A german name for the Kookaburra is Lachender Hans (Laughing Hans) because of his sound. They looks really nice and your photos of it is splendid! I can't imagine how they sounds. What a sweet little guy! Wonderful captures! Wow!! That is a great close up of the Kookaburra...we had one here once in a collection. Cute bird! Dogs don't appreciate them as much as we do. I thought our mockingbird was loud, but not after hearing some of the parrots at a wildlife refuge! Making one last trip to the kitchen the other night around midnight, I could hear the mockingbird singing in our oak tree. And I still heard it when I woke in the morning. I wonder if he ever stops! Beautiful captures Stewart .... it's amazing how we grow familiar to the sights and sounds in our every-day environment. Fantastic shots of the Kookaburra! Fabulous bird Mick, and beautifully captured!! Here, the Northern Mockingbird is nesting in the back yard and the male sings pretty much 24-hours. In between, we have the constant "cooing" of White-winged and Mourning Dove, the clear whistles of the Northern Cardinal, the drumming of the Red-bellied Woodpecker and the very non-musical noise of the Common Grackle. Love that photo of the Kookaburra! Great shots! I always wondered what a kookaburra looked like! WOW!!! Superb shots of the Kookaburra! I do love these birds and their distinctive laugh!